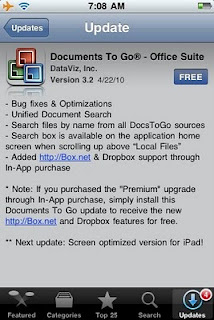 Documents To Go 3.2 for iPhone OS has landed in the Apple iTunes App Store. The biggest updates in this release are enhancements to searching, application optimizations, and bug fixes. 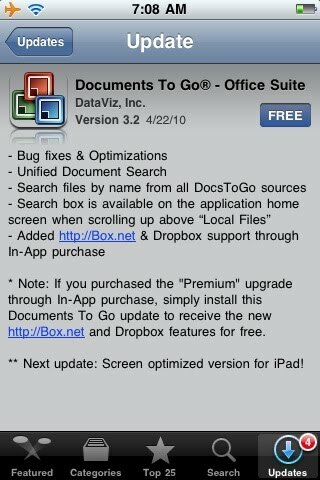 I'm excited to learn that the next update for Documents To Go for iPhone OS will support the iPad! I'm really looking forward to that since Documents To Go will allow you to work with native Microsoft Office documents. DataViz is also running a special promotion to upgrade to the Premium edition of Documents To Go. On my iPod touch, using the in app upgrade option, I can step up to the Premium edition to gain Exchange attachment support and Box.net/Dropbox support for $4.99. Not a bad offer if you ask me. Hit the App Store icon on your iPhone, iPod touch, or iPad to get the latest update to Documents To Go.